Take WUFT with you! 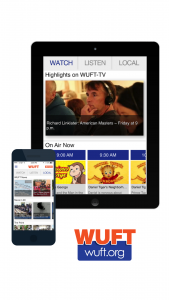 The brand new WUFT Public Media app allows you to watch and listen to all of WUFT’s programs, Radio and TV! The free apps provide on-demand content of all your favorite shows; live streaming of WUFT 89.1 / 90.1, WUFT Classic, and WUFT Radio Reading Service; News and Information from WUFT News and NPR; PBS Kids! content with parental controls; easy access to the live Radio and TV program schedules; WUFT Passport; popular podcasts; plus the ability to explore additional content. DVR-like controls. Pause, rewind, and fast forward your programs with ease. Integrated program schedules for WUFT 89.1 / 90.1, WUFT Classic, and WUFT-TV including PBS, PBS Kids!, Create, World Channel, and The Florida Channel. Quick and easy access to many of WUFT’s past radio and TV programs. Easily share programs with family and friends. Set reminders for your favorite TV shows. The WUFT Public Media App is brought to you by the people at WUFT Public Media and Public Media Apps, working to provide our valued viewers, listeners, and members with great solutions to find the content you want…Anywhere…Anytime. The WUFT Public Media App for iOS is available for free in the App Store. The WUFT Public Media App for Android is available for free in Google Play.